Price:$19.50 & eligible for FREE Shipping on orders over $35. 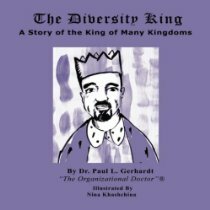 The Diversity King is a wonderful story that illustrates the power and benefits of multicultural and human diversity. People of all ages will enjoy this original and brilliant parable of the wise king who understood that each person can contribute and create synergy when everyone learns to value differences. Dr. Paul L. Gerhardt is one of the world’s premier thinkers on leadership and diversity in business. He is the author of Diversity at Work: What Every Leader Should Know to Be More Effective and Leadership Lessons: Prescriptions for Personal and Professional Success. Gerhardt is in constant demand as a keynote speaker and workshop facilitator for organizations dedicated to developing more effective leaders at every level. Clients include Fortune 500 companies and non-profit organizations of every type. Visit www.paulgerhardt.com for more information.